Fighting Irish Thomas: Bessette and Jones: honoring two heavenly Andres on the "BCS feast day"
Bessette and Jones: honoring two heavenly Andres on the "BCS feast day"
Today is January 6th, and while to most Catholics it is the Feast of the Epiphany, to many college football fans, it is simply know as "BCS Championship Eve." 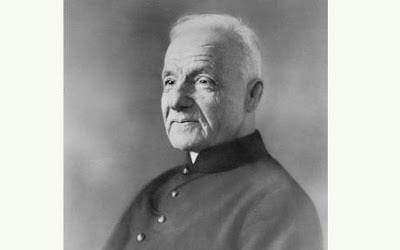 But to the select group of those who are both Catholics and college football fans, those who follow both the BCS and CSC (aka Catholic Domers) they may be pleased to realize that the last day before the big game also happens to be the Feast Day of the Holy Cross Order's (the one that runs Notre Dame) only saint, the remarkable Andre Bessette. In my own preparation for the big game day/feast day (in the moments not spent praying for the Irish, that is) I read the Catholic Register article on the Notre Dame faith/football subject, sent my way by my Catholic journalist friend, Matt Abbott. Unfortunately, this being my area of expertise, a lot of it appeared to me to be mere fluff. For example, while mentioning that a young Father Ted Hesburgh had something to do with Notre Dame's Hall of Fame football coach Frank Leahy's resignation, they didn't say Hesburgh's not-so-holy quest for making Notre Dame a so-called Catholic (as well as less athletic) research university had a lot to do with it. Also, the article mentioned that the current team is under fifty percent Catholic, but did not say that the admission board's aggressive reverse discrimination actually made it more difficult for Catholic athletes to be admitted than Protestants, Mormons or Muslims. However, the story did uncover one somewhat covered up (the administration often seems deathly afraid to display any of its Catholic side to the public) fact: that the team still hands out a saint's medal to each player, Catholic or not, before each game. The article then stated that a different saint's medal is handed out before every game, although somehow failed to detail which saints were given out during this unforgettable undefeated season. In any event, I hope that the saint they hand out for tomorrow's game is today's saint. For not only is St. Andre the CSC's very own, but his humble, faithful life was in stark contrast to Notre Dame's current over-emphasis on hiring expert professors at any cost, including Catholicism. Not only was Bessette not a scholar, the Order never promoted him above the role of doorman, or as St. Andre used to say, "My superiors showed me the door, and I stayed there for forty years." Of course, Andre proved to be hardly your average doorman; for by the time God called him home, so many who met the man were cured ("by Saint Joseph!" the humble one insisted) that long lines always waited to greet him, and Bessette was beset by over 80,000 letters a week by those who couldn't meet him in person. But besides the fact it is his feast day, and Bessette's unique humility to do anything to be a team player, there's yet another reason that I wish the team (if they indeed do not already possess it) to be given his medal, and that is the name Andre itself. For in between Oct 17, 2010, the day Andre Bessette was canonized a saint, and Janurary 7, 2013, the day Notre Dame plays Alabama for the National Championship, Andre Jones, a leader of Notre Dame's last championship team and father of current Irish wide receiver T.J. Jones, died unexpectedly of a brain aneurysm. And while the cynical person would claim that T.J. now playing in the championship game only to be unable to share it with his best friend and father, must at best be bittersweet, I believe the message of Our Blessed Mother would be just the opposite. For if Our Lady was called upon to give the pre-game pep talk, I think She would say how fitting it is for the Fighting Irish to have not only St. Andre Bessette as the team's heavenly link to the University's Order, but the Lord's servant Andre Jones as their heavenly link to the 1988 Notre Dame Championship team. Alabama may have more talent than Notre Dame, says She, and Nick Saban may be a better coach than Brian Kelly, but something besides pure skill often decides the outcome of such moments. In other words, after taking into consideration all the great secular causes both the Tide and Irish play for, with Our Lady, the two Andres and all the others who have gone before, Notre Dame will always be playing the game for a little something more.